It wasn’t ‘Old McDonald had a farm’. Actually, the farm belonged to the Duchy of Cornwall although it was being run by farmer, Richard Hoskins. Near Dorchester, almost over-looking the Prince of Wales new town of Poundbury, the beef farm turned out to be a key supplier for McDonalds. The expedition was the first of McDonald’s new Open Farms programme and we were accompanied by silver medal Olympic athlete Heather Fell who plans to compete in London. 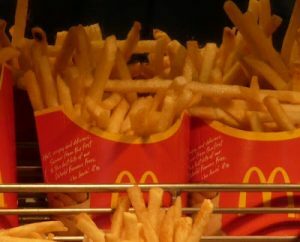 McDonalds is an official Olympics sponsor and will be supplying food at the 2012 Games. In fact, they anticipate that their Olympics restaurants will be three times as busy as the busiest McDonalds restaurants at peak time – and that they will be providing one in five of all meals at the Olympics. Wow. Contrary to popular belief McDonalds source all the beef for their UK restaurants from Britain or Ireland. Many of the calves on the farm I visited were male fresians, which are of no use to the dairy industry. I was surprised to learn that the quality of this beef isn’t very different from a real beef cow – but they grow much slower. However, one of the key elements in getting healthy cows and improving growth rates is making sure that these calves get colustrum from their mother’s milk in the first few hours after birth. Those that are denied this life-giving sustenance will have a weakened immune system and won’t thrive. We also talked about the animal feed. Soya is still used – and the company has to check that this doesn’t come from any place where it’s causing deforestation. The farmer explained that it still isn’t economic to grow alternative protein feed crops in the UK, which might be a better environmental option. It appears research into this is ongoing. Another area of research, in this case sponsored by McDonalds, is animal welfare. A fellow guest on the tour was Mike Gooding from the Food Animal Institute (FAI), where McDonalds is a founding member. He told me about the work they were doing on animal behaviour and how that should be considered in modern farming practices – for example promoting chicken rearing in apple orchards. And he had interesting ideas on taking an eco-system thinking approach to agriculture. On to the restaurant in Weymouth. Full of enthusiasm I volunteered to make some Big Macs. Having washed my hands and donned a hat and coat I was given instructions. These were also written on a card. First get the bun. Give it a squirt of sauce – not sure what flavour – then the onions and salad. Fetch the burger from the grill, add a slab of cheese and finally the gherkins. I may have missed something, but that’s about it. My burgers were boxed and on display within seconds. For me, the most impressive thing in the restaurant was that they only wasted about 1% of the cooked food. Kitchen staff are given a detailed sheet on how many of what items should be ready depending on how busy the store is – and clearly they’ve worked this out to a tee. By contrast, at Yo Sushi I discovered that they waste about one third of the food they produce. Not so good, in my view is that McDonalds has some way to go on its wasteful packaging. And the manager at Weymouth wasn’t sure what coolants are being used in the refrigeration – these can be a major contributor to climate change. I also have to admit that I’m not a great fan of McDonalds food – I didn’t eat any Big Mags or other burgers, although I couldn’t resist some chips. My relationship with McDonalds goes back a long way. In the late 1980s they tried to sue John Elkington and I for what we said about them in the Green Consumer Guide. Since then, the company has moved on a long way. In fact, I think they’ve gone a lot further than they’re generally given credit for. Most environmentalist see McDonalds as an eco-demon. I think that behind their iconic yellow arches lurks some surprising green thinking – and I welcome it. 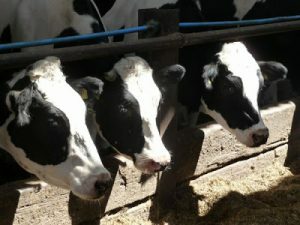 This entry was posted in Business, Done, Farming & Agriculture, Food & drink, Home Page, Media & Communications, News 2010 and tagged Farming, Fast Food, Food. Pretty nice place you've got here. Thank you for it. I like such topics and anything connected to them. I would like to read a bit more on that blog soon. At last! Someone who has researched McDonalds without letting politics or anti-American prejudice get in the way of the facts. It takes a lot of guts to be honest about this issue – you really come up against a lot of deep-seated aggression and vitriol from anti-McDonalds brigade (whose gripes, let's face it, are based on preconceptions formed during the 1980s). Thank you Julia for keeping a cool head!